/Top 10 Questions /What is Mailing Service and how does it work? We provide a Mailing Service option where we print, package, address, seal, and stamp your stationery and send it directly to your friends and family for you. You can opt for this convenient, time-saving option at checkout. Learn more about it below. Can you mail only some of my cards? Yes, you can select the number of cards you want us to mail for you, and we will ship you any remaining cards or envelopes. Regular shipping costs and times apply. Yes, you can pick a specific date, up to one month in advance, for your order to be mailed from our facility. The available date options depend on the processing speed selected for your mailing service order. Please note that the date you select must apply to your entire order and delivery to the recipient on a specific date is not guaranteed. Mailing Service for Rectangular Envelopes: $0.85 each. Mailing Service for Square Envelopes: $1.05 each. The cost includes the envelope printing (black ink), first-class USPS postage stamp ($0.70 for square cards and $0.49 for rectangular cards), envelope stuffing, and mailing. Can I personalize envelopes when using Mailing Service? Yes, you can opt for personalize full-printed envelopes or personalized return address only envelopes. The price of the envelope printing option you choose will be applied to your total, in addition to the cost of Mailing Service. Please note, if you opt for personalized envelopes, the mailing address portion of the envelope will be printed in black, Times New Roman font. Can I personalize envelope liners when using Mailing Service? Can Mailing Service be used for recipients outside of the US? Mailing Service is currently not available to recipients outside of the US. What is the difference between Full Mailing Service and Address Printing Only? With Full Mailing Service, we print, package, address, seal, stamp and send your stationery for you. With the Address Printing Only option, we only print your recipients’ addresses on your envelopes. This option will save you time, but you’ll still have to package, seal, stamp, and send your stationery after you receive your order. 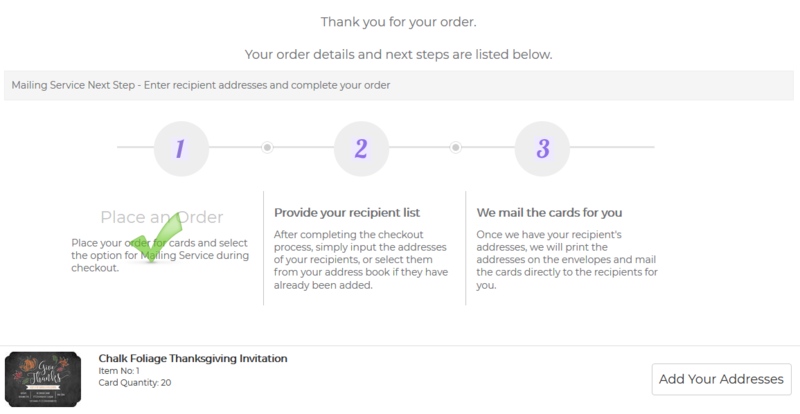 After placing your order, you will be prompted to enter your recipients’ addresses. You can enter your addresses at this point or you can add addresses at any time by logging into your account and clicking on the Account icon near the top of your screen. This will bring you to your Dashboard where you will have two options to upload your addresses. First option, there will be a red banner across your page. You can click on “Click to Complete Order” to upload your address list and complete your order. Second option, you can click on the My Orders tab in the toolbar on the left. It will bring you to your Order History page, where you can click on “Add Your Address” link to add your addresses and complete your order. You’ll also receive an email after placing your Mailing Service order. The email will provide more information on Mailing Service and include a link that you can follow to enter your addresses. 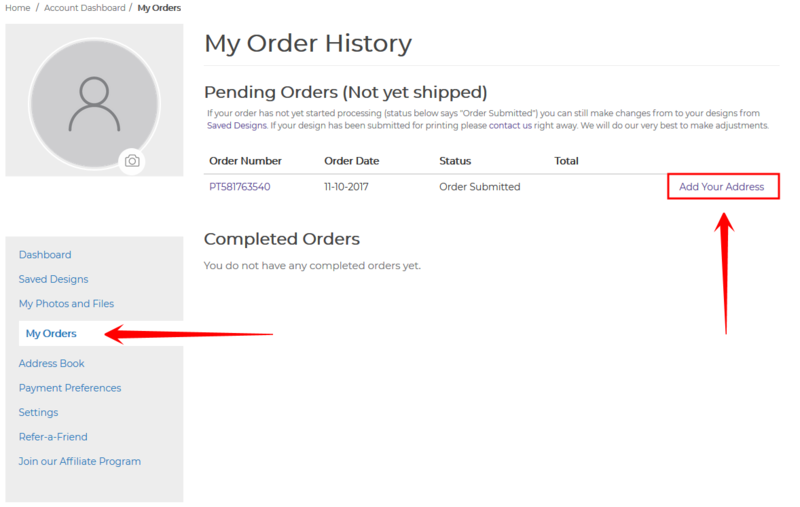 Your order will not be complete until you’ve added all your addresses and mark your order as complete by clicking the “Complete Your Order” button. You will receive an email as soon as your cards are mailed from our facility. Can I have the addresses printed on my envelopes and the cards shipped to me so I can post them? Yes, select “Print Recipient Addresses on My Envelopes and Send All Cards and Envelopes to Me” when adding your cards or invites to your shopping cart.